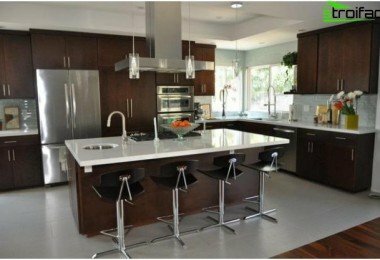 Kitchen corner - photo of the best solutions for your kitchen. We will help you to decide on the form and style. 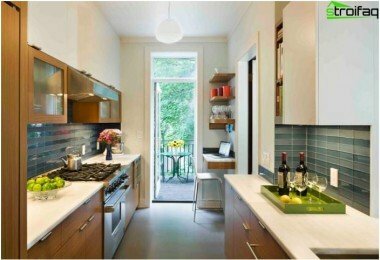 Tell you how to properly fit the kitchenette into the small kitchen and what decor to choose. 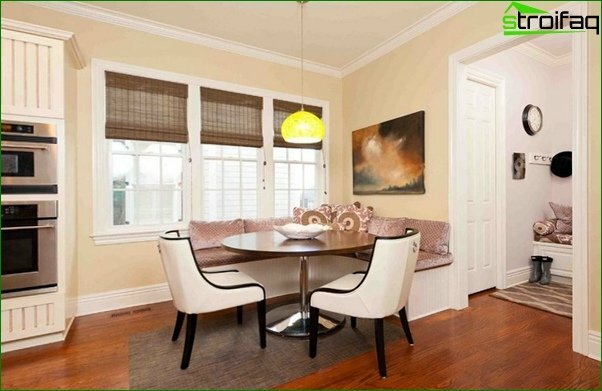 Comfort for the kitchen is also important, as for a bedroom orLiving room. 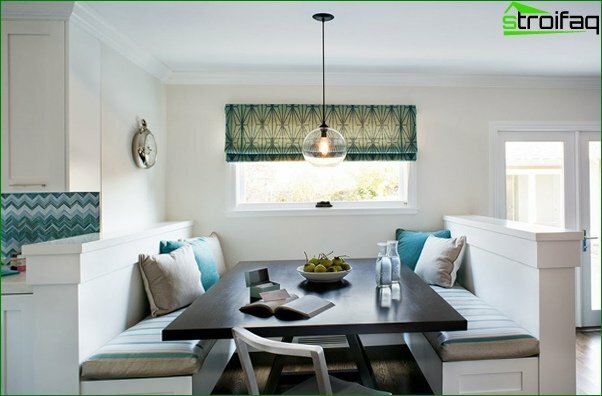 Especially if the kitchen performs also the role of a dining room or a place for evening gatherings. 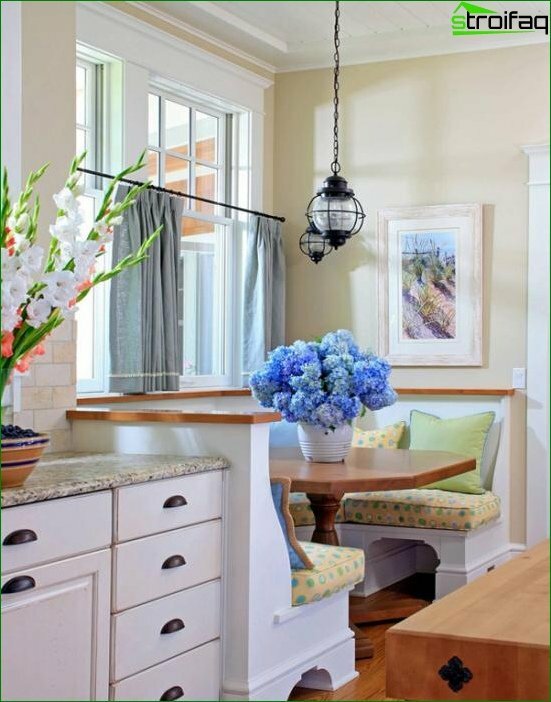 To create not only a practical, but also a cozy kitchen design will help you kitchenette. And as it is better to make - look on a photo more low. 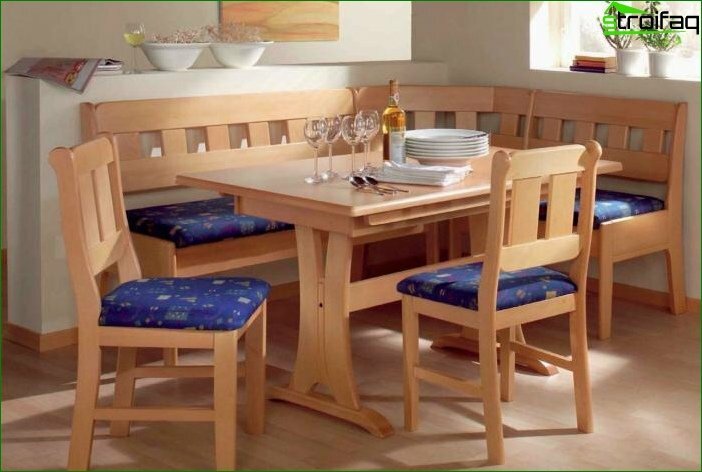 The ability to accommodate a significant number ofGuests in comparison with chairs and stools. 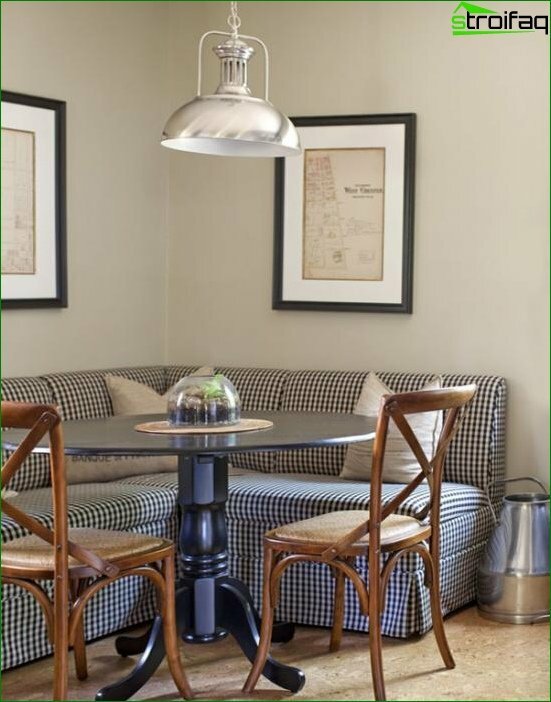 With a rare exception, when one of the guests is ready to sit on each other's laps, kitchen chairs or stools assume the placement of one person in one place. In the case of corners, everything is much simpler: it is possible to arrange as many guests as it actually is placed throughout its length. In crowded but not mad. 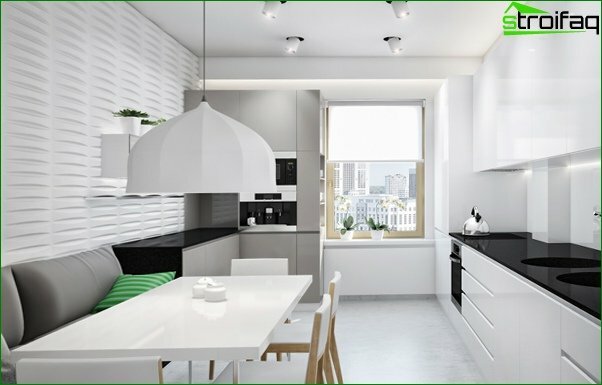 Charming atmosphere of softness, warmth, coziness onKitchens are created precisely because of the kitchen corner. Going to such a kitchen, it immediately becomes clear that it is not easy working place for cooking, but also a place of friendly gatherings. 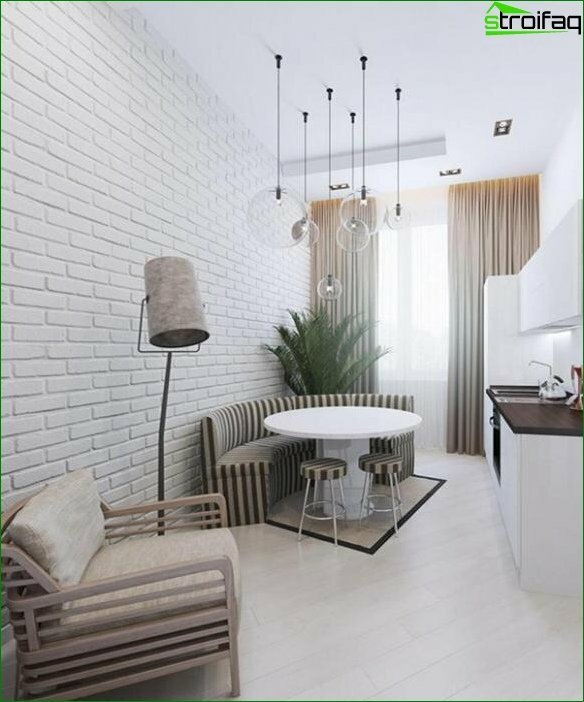 The kitchen corner, thanks to its convenience, canTo become an alternative place of leisure for someone from the family. This is especially true for one-bedroom apartments, when sometimes you want to relax from each other or watch different programs on TV. 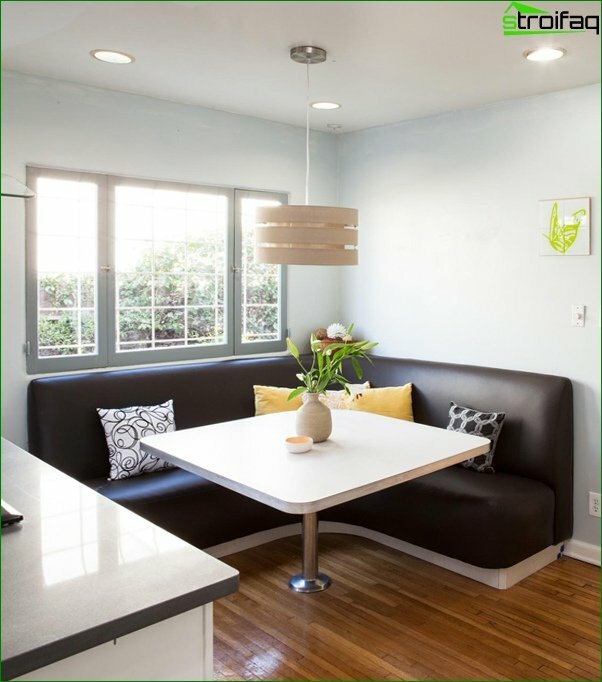 Typically, kitchen sofas are equipped with an extra space for storing utensils, kitchen utensils or products (cereals, macaroni, sugar, nuts). 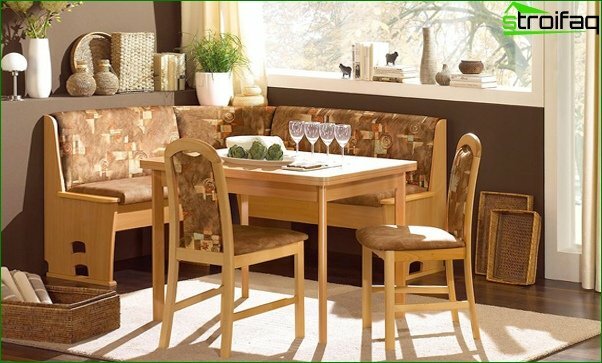 The richness of the colors of textile upholstery (especially from Ikea) makes it possible to create a perfect kitchen set even for the most pretentious aesthetes. 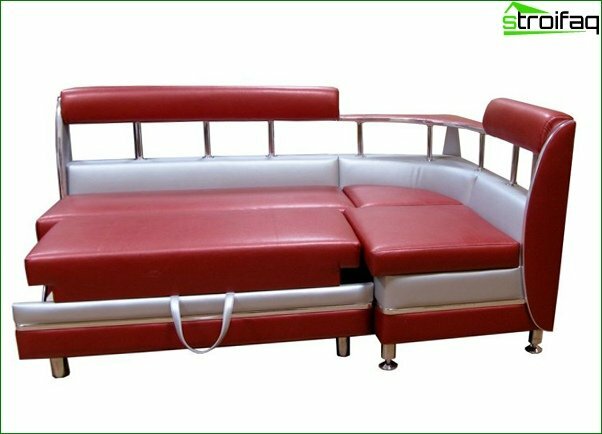 Extra bed, which can be equipped with a kitchen sofa, will help you in the period of unexpected invasion of friends or relatives. 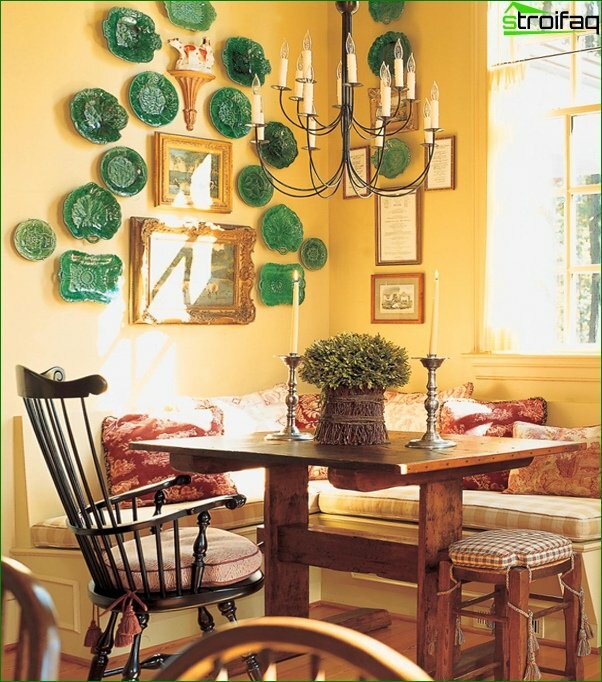 Nevertheless, it is necessary to remember and the shortcomings associated with the kitchen corner. 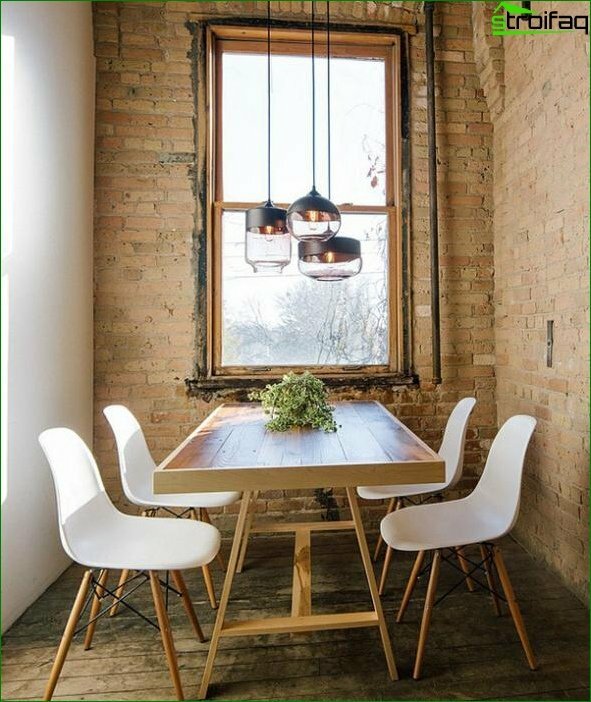 Placing guests at the kitchen table on the couch significantly restricts their freedom of movement - to get out of the table, you will have to disturb a number of those seated. Kitchen corner sofa significantly complicates cleaning in the kitchen, because it is as easy to move as a stool (especially if the dishes are stored inside) you will not succeed. 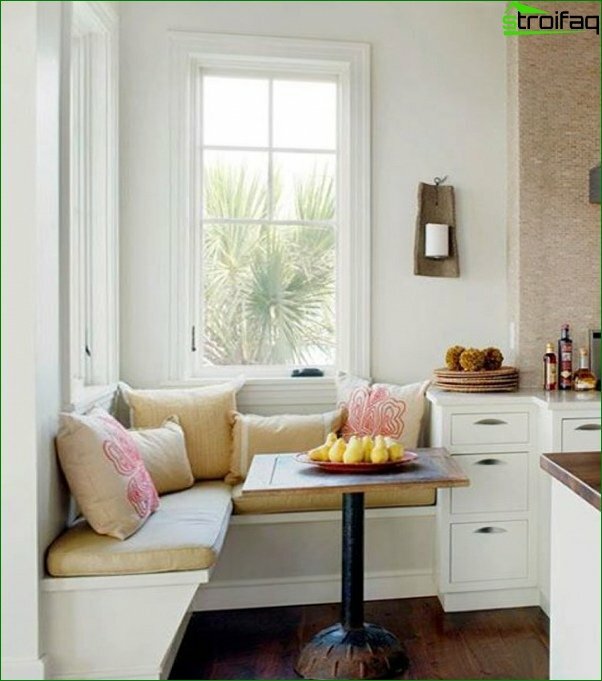 For a small kitchen corner kitchen sofa is better not to use, because it will take a huge amount of space. 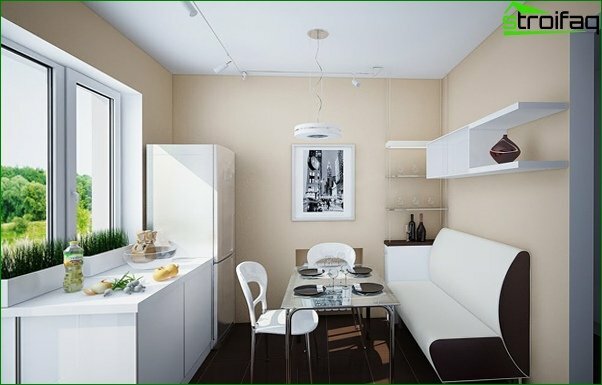 The kitchenette is different from the dining roomThe presence of a sofa. As a rule, the kitchen corner is sold as a single set, but it also happens that all the details must be selected and combined independently. What are these details? Kitchen couches differ significantly from the sofas in the bedrooms. 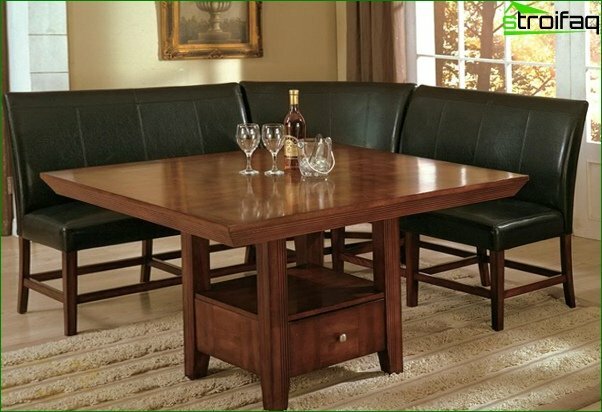 Like other furniture for kitchen kitchen sofa should be functional. In addition, it is very important that it is easily cleaned of dirt. 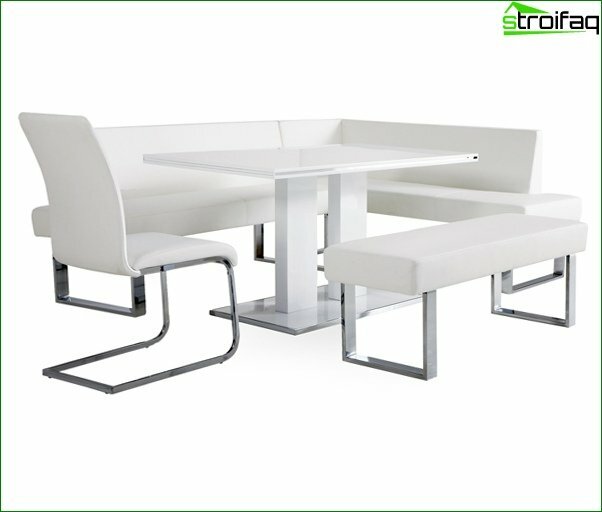 Sofas can be on legs, and can be equipped from below with curbstones with drawers for storing utensils and products. The dimensions of the sofas depend solely on your needs and the size of the kitchen. 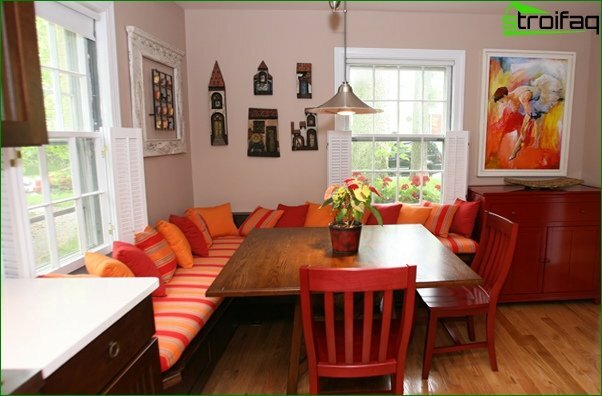 Limit sofa for the kitchen as a place for the seat experts strongly do not recommend. 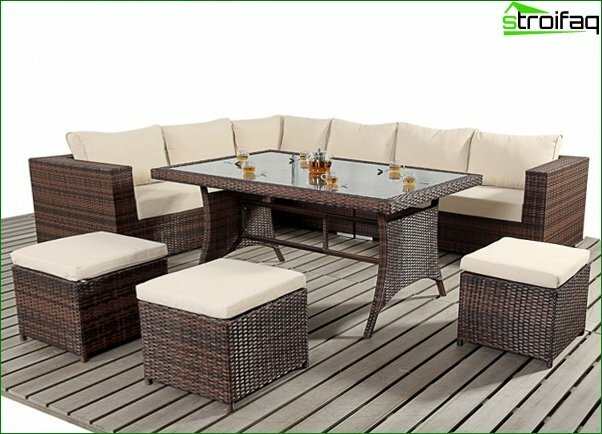 Firstly, during the meal only that part of the dining table will be used, near which there is a sofa, which significantly limits its capacity. 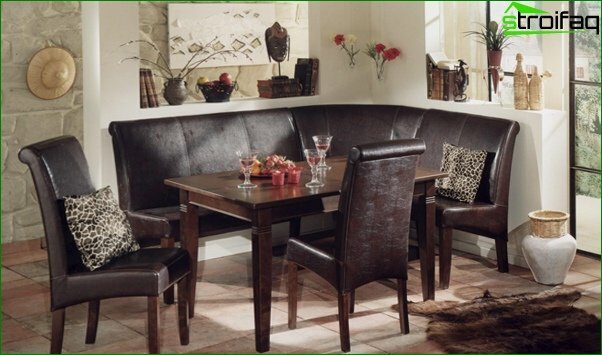 Secondly, even if you dine together, it is sometimes more pleasant to sit opposite each other, which is almost impossible with a corner sofa. 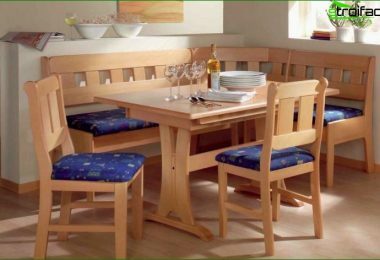 Thirdly, chairs or stools are requiredUseful in the household, for example, if necessary, something to put on them during conservation or to get something from the upper shelves of hanging lockers. 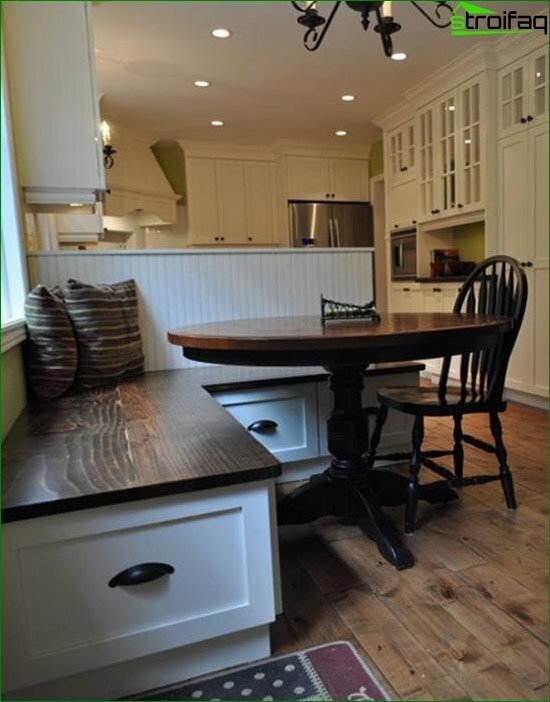 However, you can also combine the objects of kitchen furniture on your own. 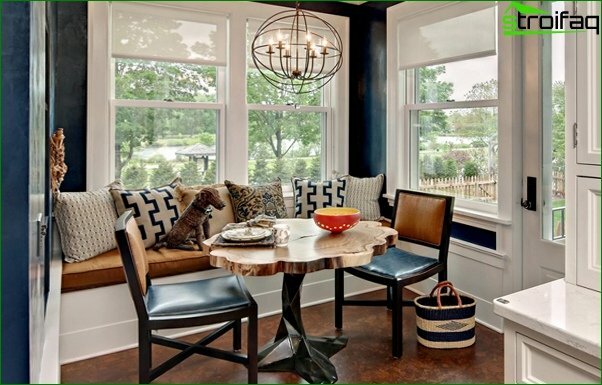 When choosing a table for a kitchen corner, you should focus on how many people will regularly dine with him. 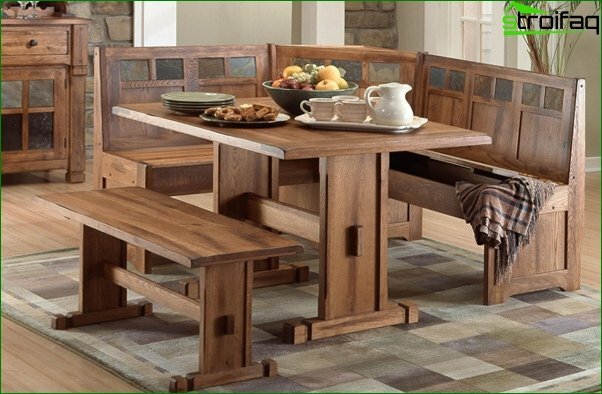 If large companies visit you from time to time, it makes sense to buy a folding dining table that can grow two or three times in size. 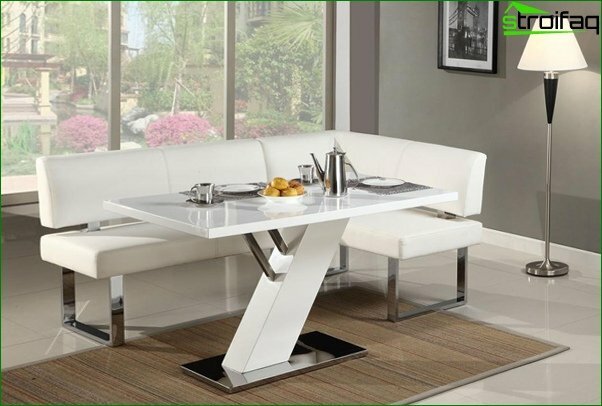 Use a dining table with solid ends instead of legs together with a corner sofa will be inconvenient - sitting next to them, there is simply no place to put your feet. 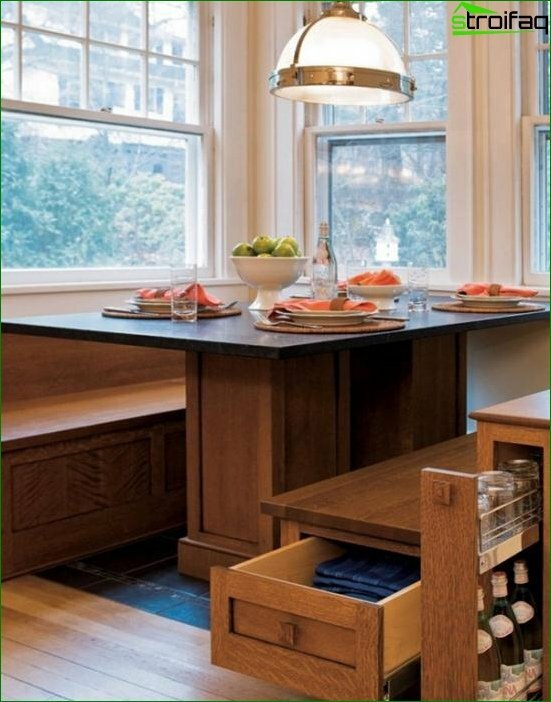 For small kitchens, it is better to use tables of streamlined round shapes (for example - oval). 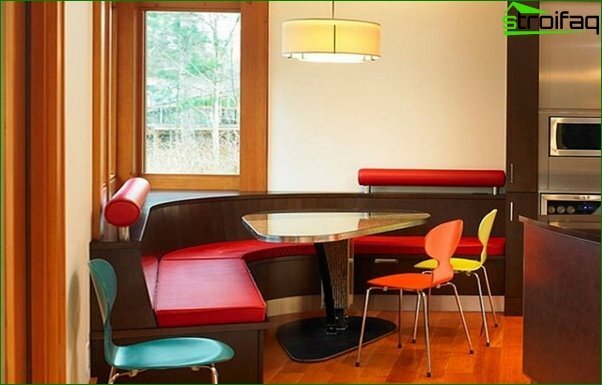 Read our material on how to choose kitchen table. However, we would like to surprise more attention not to the skeleton, but directly to the place for sitting. 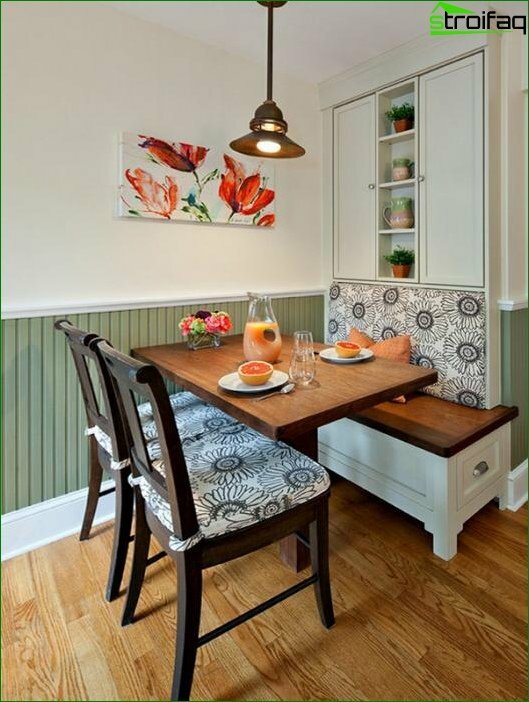 Seats and backs of hard kitchen corners, as a rule, are made of the same material as the frame (although there are exceptions, for example - a metal frame and wooden seat). 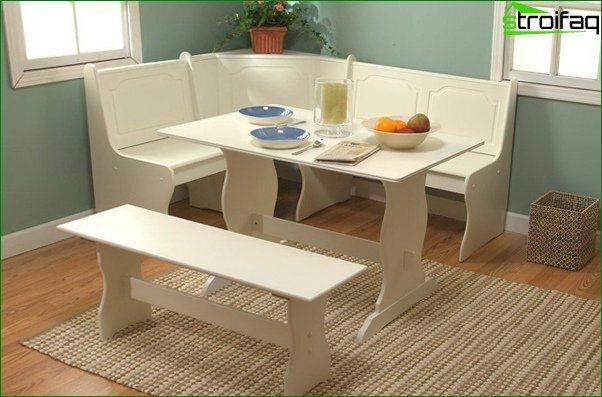 By and large, this is an ordinary bench(Angular or linear), stylized as a general interior of the kitchen and performed by a single ensemble with stools and a table. 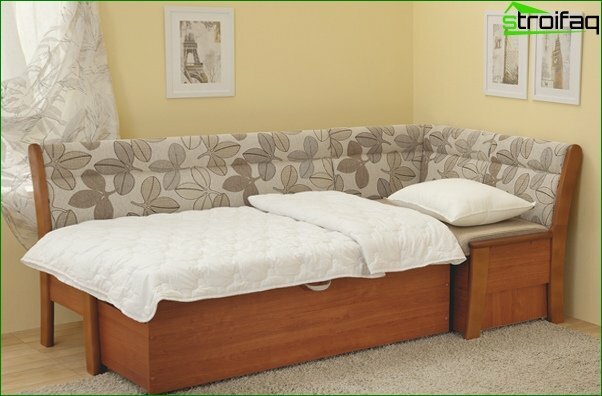 In such couches, a storage space may or may not be present. 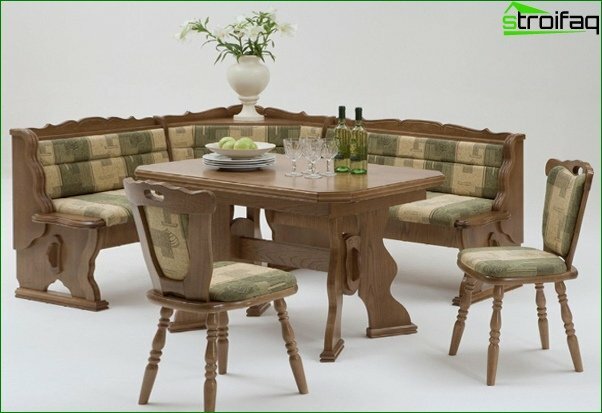 Since there are no soft upholstery, such a piece of furniture is very practical and easy to clean. It does not accumulate dust, and you can actually wash it. 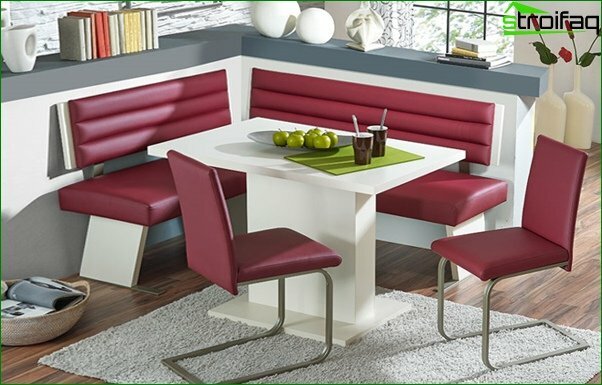 Islet of coziness on kitchen In many respects it is created thanks to the soft textile upholstery of the sofa. If you have a soft kitchenette, then all kitchen textiles should be chosen so that it is in harmony with the upholstery. 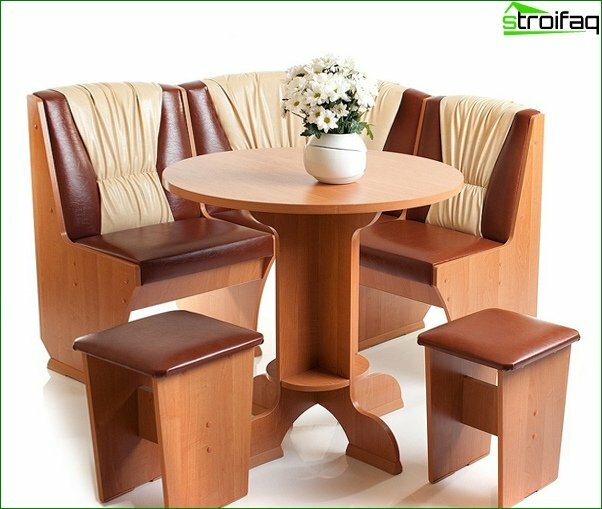 Unlike other materials, leatherette does not absorb moisture, so it is recommended by experts for upholstery kitchen corner. Combined kitchen cornersA combination of soft and hard materials. They look very stylish and functional enough. Combined hard inserts allow the use of such a sofa not only as a place for sitting, but also as stands or shelves. As you can see from the title, corner kitchen sofasRepresent an angular structure. They can be either whole or modular, which is much more convenient, since if you need a permutation, you can "deploy" the corner in the direction you need. 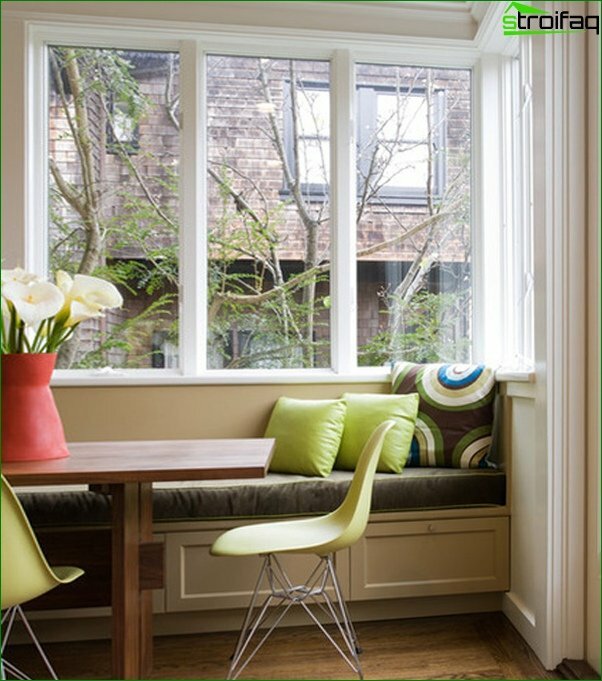 Such sofas allow you to make the most efficient use of the space on which they are located, including the kitchen corner. 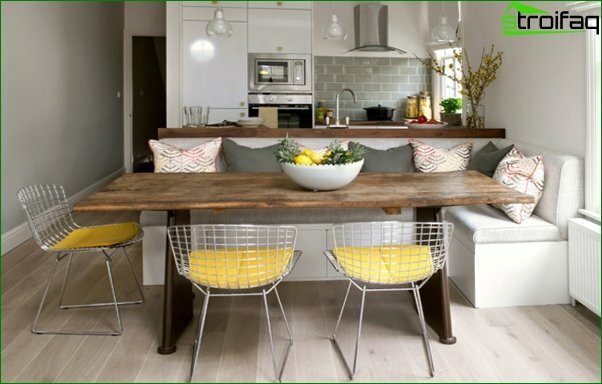 The only, but very significant drawback is that it is not recommended to place such a sofa in a small small kitchen, as it will take up most of it and banally hamper the movement along it (including the cooking process). 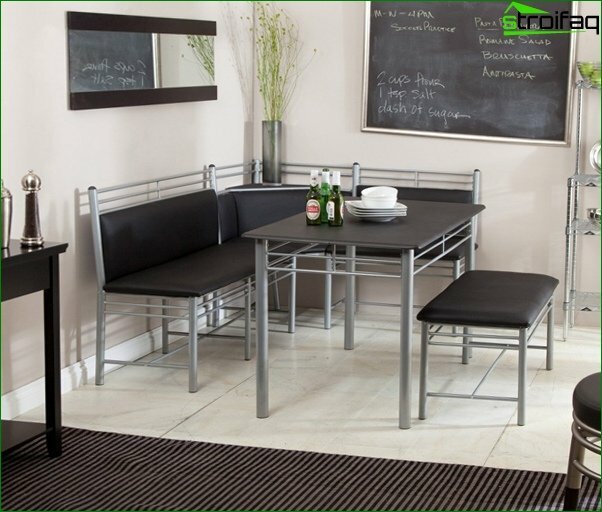 Linear kitchen sofas, in contrast to corners, are very compact and comfortable. They do not take up unnecessary space, so it is very convenient to use them even in Miniature kitchens. In principle, from any modular angularSofa, you can select one module and set it as linear. The smaller module, in turn, can be used as an armchair and placed next to or opposite. Modern kitchen corner - not overloadedDetails. 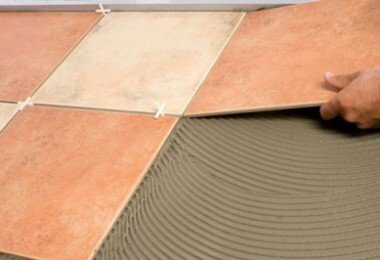 It can be made of a wide variety of materials. 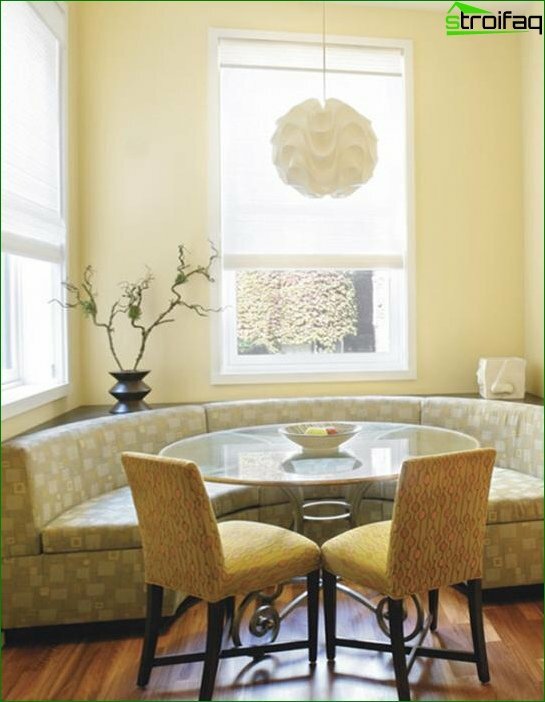 A distinctive feature of the modern soft kitchen sofa is a rich, rich palette of upholstery colors. 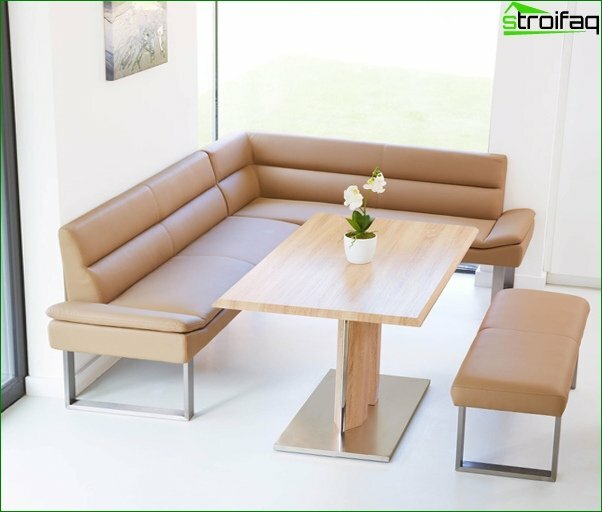 Such sofas perfectly fit in the styles of high-tech, minimalism, industrial, fusion. Corner that would fit perfectly into the styleCountry, must necessarily be made of wood. Best if it is an ordinary wooden bench. 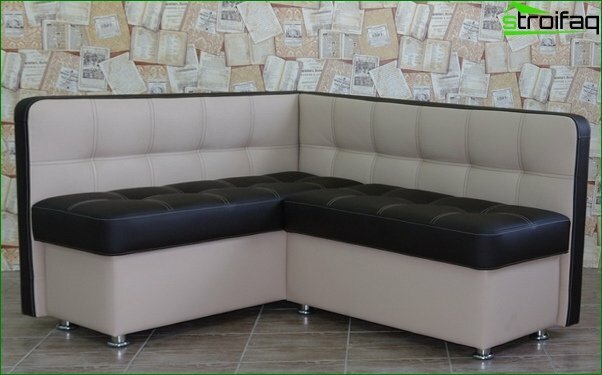 However, there is no need to comfort to sacrifice style, especially since in this case it is not so necessary: ​​soft textile upholstery is quite acceptable. Textiles should be made from natural fibers, discreet and natural colors. Give an old Soviet kitchen cornerNew life? Easily! Make it a stylish vintage thing in retro style! Today, on the Internet, there are a lot of companies that are engaged in the restoration of furniture. If you are embarrassed by the price of their services - with restoration you can manage yourself. The amount of effort directly depends on the number of required works. 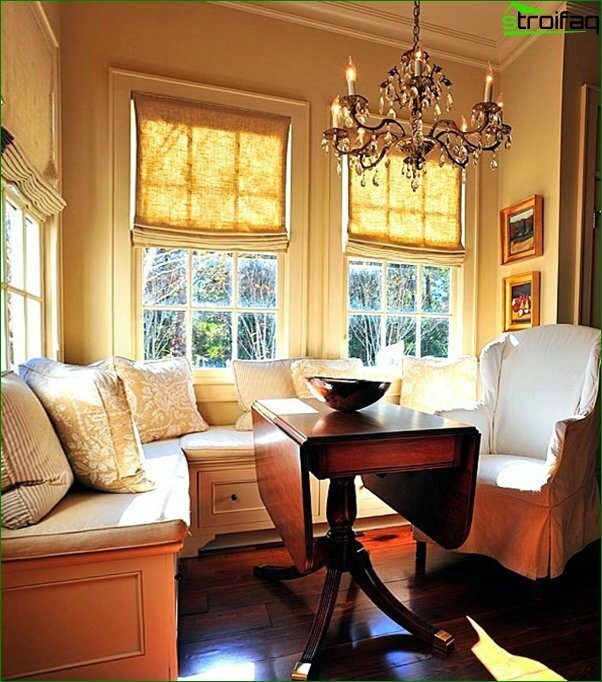 But most often it is necessary to update the varnishing or the color of the wooden parts and change the upholstery. 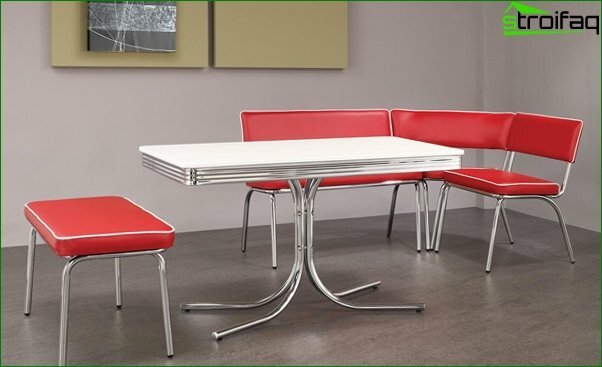 Also a corner for the kitchen in retro style can be made to order or look in the catalog - today this style is very relevant, so the assortment is varied. Extra bed - never happensSuperfluous. Especially in one-bedroom apartments. You'll never guess when a second-aunt or a childhood friend comes to visit your city on business. 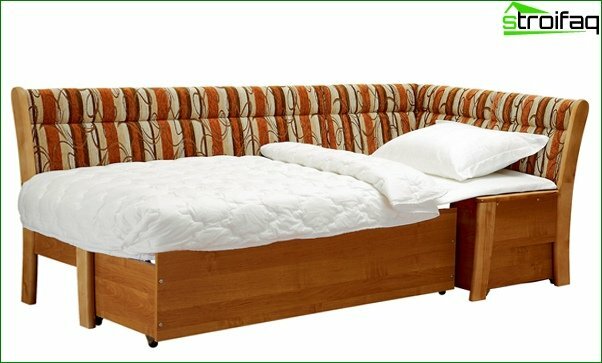 The construction of the transformation of a simple kitchen sofa into a full bed is very diverse. The photo below shows only a few, but the most popular of them. 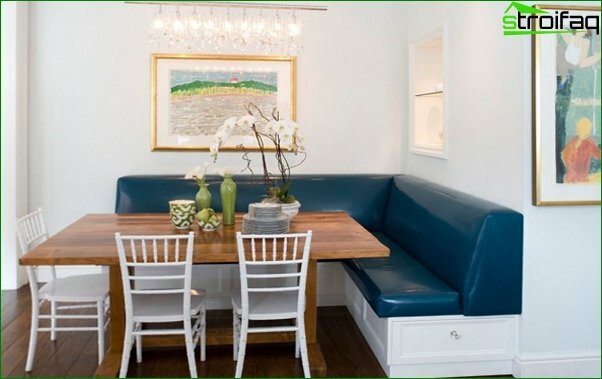 However, a kitchen sofa with a sleeping place can not fit in every kitchen, because at least one side of it should be long in human growth (that is, almost 2 meters!). The sofa with a bed has one more drawback - the need to put the kitchen table somewhere to decompose it. 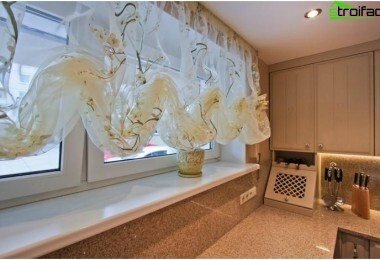 Kitchens in Khrushchev, even in the largest apartments- Small. 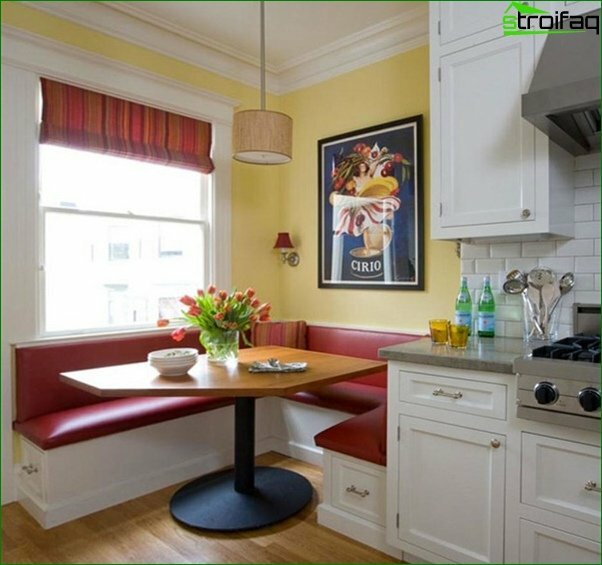 And to place in such kitchenette a high-grade kitchen sofa is rather problematic. 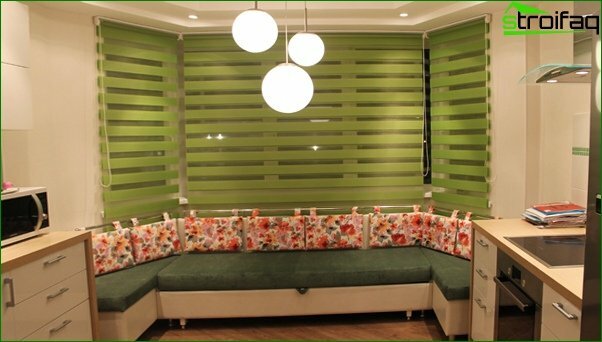 It is best to give preference to linear small sofas or a kitchen set from a three-seater corner sofa, a round table and stools instead of chairs. 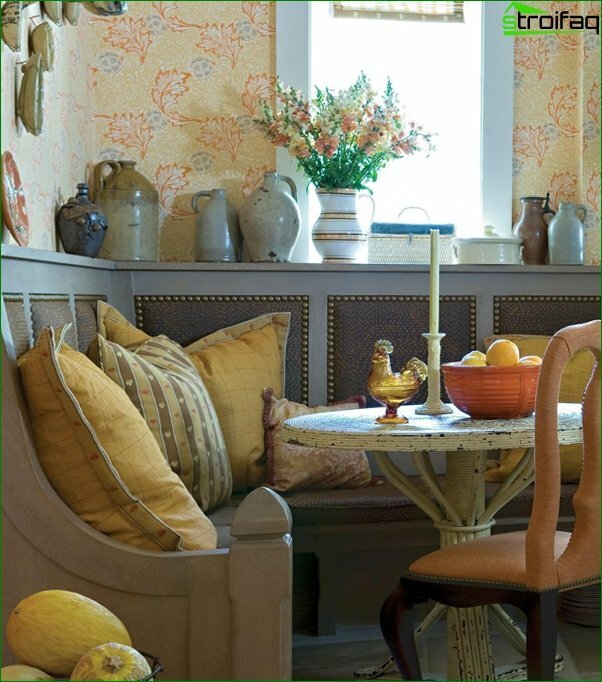 From the point of view of practicality, decorating the kitchen corner is a silly undertaking. But beauty and comfort should not be logical! All their charm is in the emotions they cause. 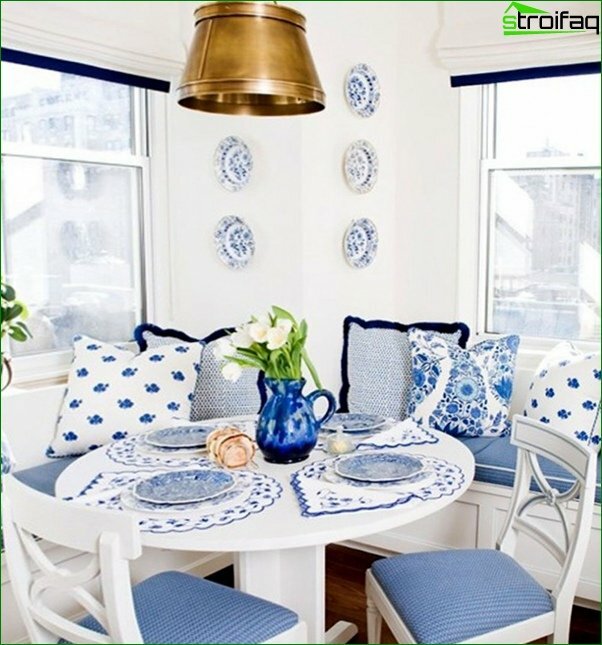 To decorate a kitchen sofa it is possible beautiful pads (that is very actual for kitchen in ethnic style). For the same purpose, you can use charming blankets. The backs of the sofa, if they are flat, can be used as shelves for every kind of small things, figurines and other decorative details.